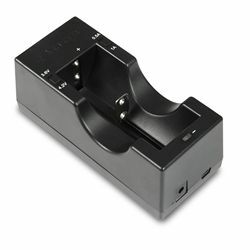 This small single bay battery charger will allow you to recharge your flashlight batteries on the fly. This charger is compatible with USB and Mini-USB. Only usable with certain battery sizes. Includes an AC wall adapter and car accessory port charge adapter.